V60 from the Japanese manufacturer Hario is perhaps the most common and reputed brewer for Pour Over. This is similar to the classic ceramic Melitta manual brewer. The difference between these two is that the Hario V60 is shaped as a “V” while Melitta’s is shaped as “\ __ /”. Personally, I think that the Melitta is an easier method of brewing at the beginning of your adventure with manual brewing. The Hario V60 belonging to the category of cone-shaped brewers is a more complex brewing, but done properly makes it a phenomenal cup of coffee. The Hario V60 is available in several sizes and materials. 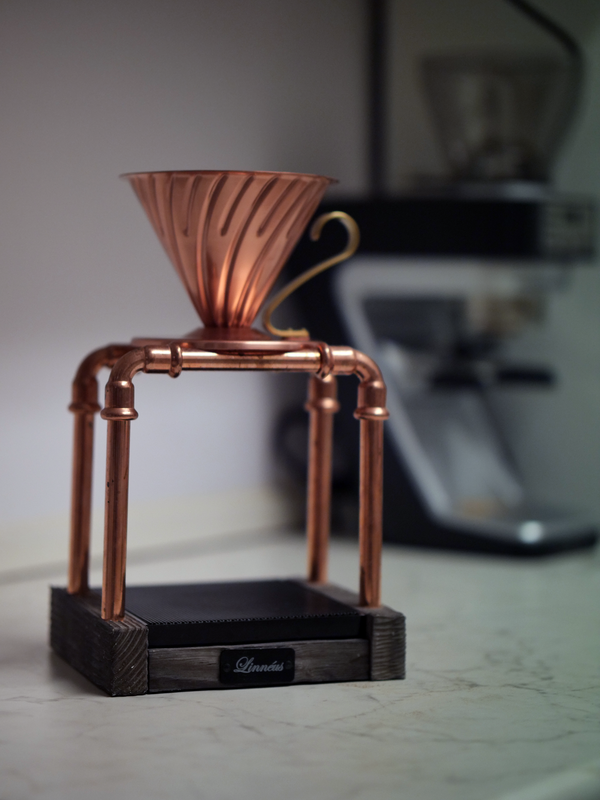 In the picture above I have a Hario V60 in copper. There are also ceramics, plastic, glass or other metals. The Hario V60 uses specific filters, just like the brewer, the paper is cone formed and it will attach to the brewer when the paper becomes wet. The spiral shapes on the edge will apply an extraction to the coffee on the edge as well. 1) Always rinse your filter with water. Reason: The paper filter still has a taste, try it yourself; put the filter it in your mouth and you will notice that it is not a very good taste. a) You can rinse with cold under the tap and then with hot water to heat the brewer. b) You can use hot water only. If you rinse your filter over a cup/pitcher, do not forget to drain the water first and then rinse the container so that no paper filter water remains. 2) 40g blooming for 35 seconds, stir with a bamboo stirrer to get all coffee moistened. 3) 125g water in a circular flow (this includes 40g water blooming). This including 40 second blooming, your timing should be on 1 minute and 20 seconds. 4) 100g of water in a circular flow with a finish (about 10-15g) on the edge. A total brewing time of 1 minute and 45-50 seconds. This is the best pour over brewer in my opinion, the Japanese manufacturer Hario delivers a charming and modern design in many different variations to suit everyone. This is a challenge for those who want to try a more advanced brewing, which gives amazing results.